Poke cake was invented by the General Foods Corporation in 1969, as a way to increase sales of their flagship product, Jell-O. 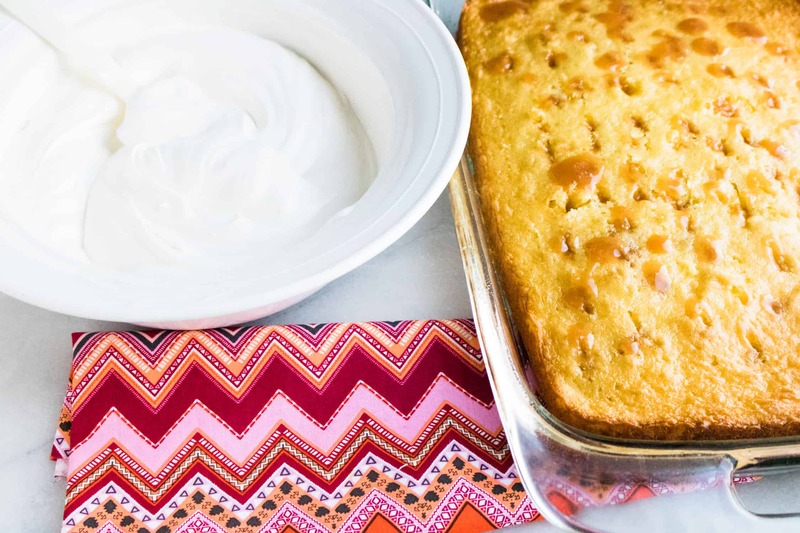 And you can make the original Jell-O version by baking a white sheet cake, and when cooled, poking holes with a fork all over the top of the cake. Next, strawberry Jell-O mix is poured all over the top of the cake, allowing it to fill the holes. Then put the cake in the fridge and allow the Jell-O to fully set. Then, frost the chilled cake with whipped topping and it’s ready to serve. The retro-style poke cake is enjoying a bit of a renaissance, but bakers are now moving beyond the traditional gelatin and filling their poke cakes with everything from flavored syrups and chocolate, to coffee, cocktail mixers, and of course, caramel. 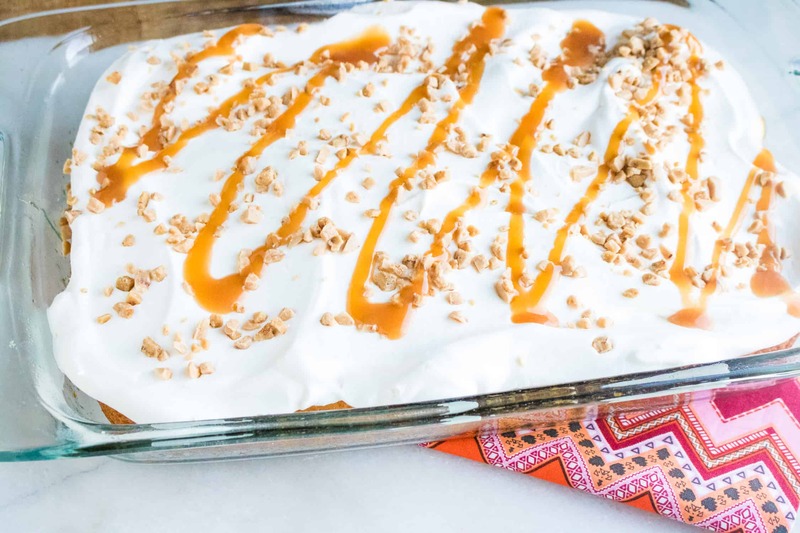 Our Caramel Toffee Poke Cake recipe is loaded with caramel flavor. 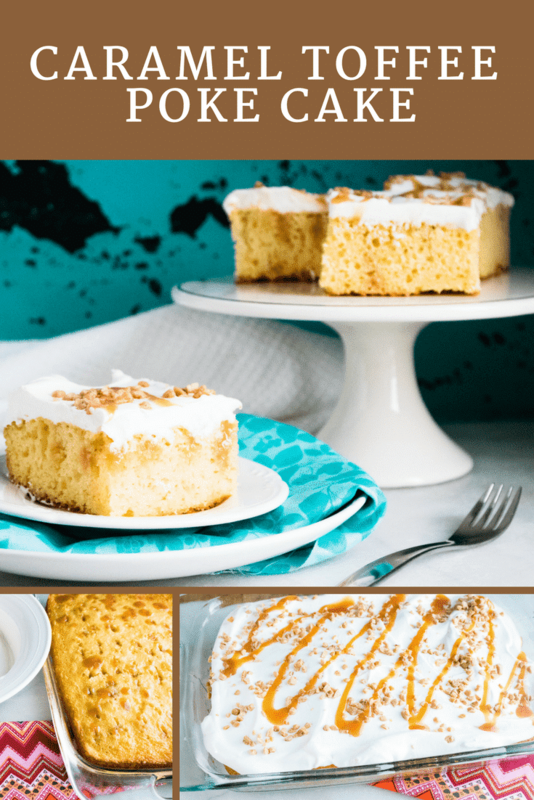 In addition to pouring caramel syrup on the top of the cake and allowing it to soak into the holes, caramel creamer (yep, the same one you use in your morning coffee) gets added to the cream cheese frosting, and a generous drizzle of caramel sauce completes this delectable treat. And, did you know that it’s quite easy to make your own caramel at home? Caramel is a created when sugar is slowly heated to 340 degrees Fahrenheit (170 degrees Celsius). At this point, the molecules break down and form new compounds that have a deep, rich flavor and dark golden brown color. This is known as caramelization, and can be achieved with any type of sugar. Combine 1 cup of sugar and 1 cup of water in a saucepan. Immediately remove from heat and stir in an additional 1 cup of water. Return pan to heat and continue stirring until liquid is fully combined. Transfer to a heatproof container. Craving even more delicious caramel flavor? Check out our Apple Caramel Cheesecake Recipe, or try making this easy No-Churn Salted Caramel Ice Cream. 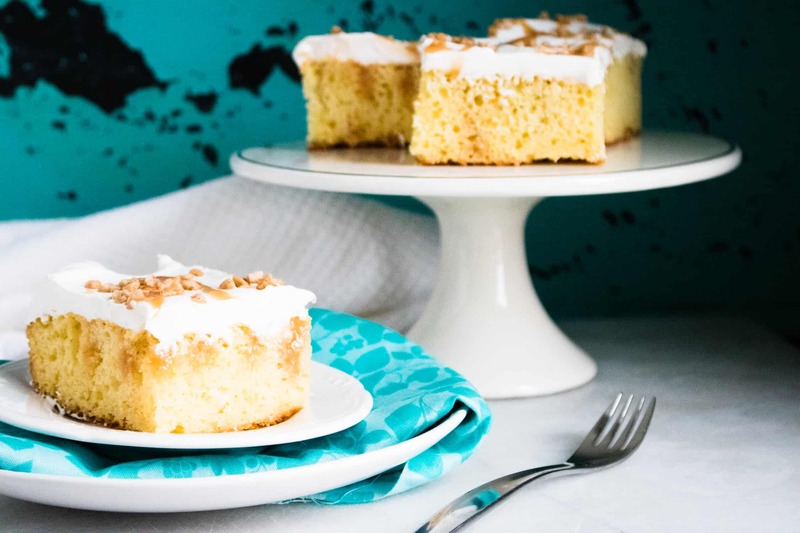 For other fun and unique variations of poke cake try, Cherry Almond Poke Cake, Chai Spice Poke Cake, or this adults-only Boozy Pinepple Piña Colada Poke Cake. Bake cake in 13×9 pan according to package instructions. Allow to cool. Using the end of a wooden spoon, poke holes in the top of the cake. Pour caramel syrup over the cake, making sure to pour over the holes. Next, cream together cream cheese and powdered sugar. Mix in the caramel creamer. Pour and spread evenly over the cake. Top with whipped topping and toffee bits. Drizzle additional caramel over the top of the cake, if desired. Chill for 4 hours before serving, then slice and enjoy! 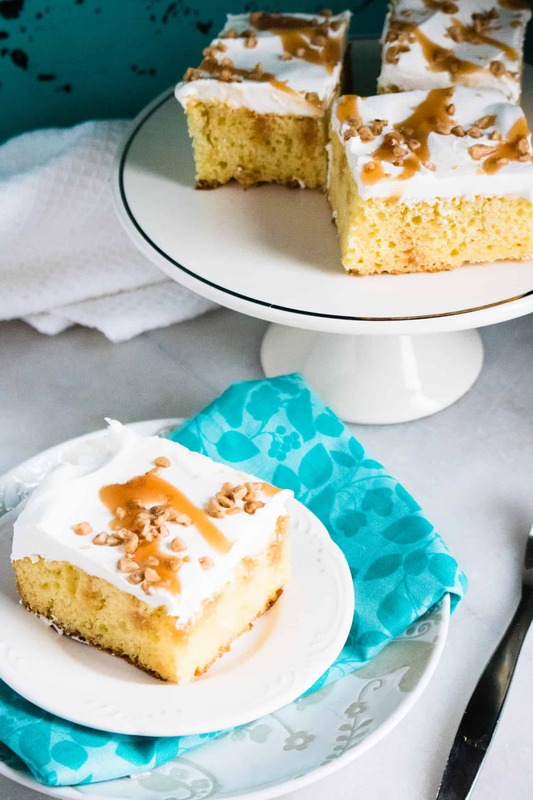 Caramel Toffee Poke Cake comes together in a snap, but looks and tastes like you spent hours baking. Additional caramel to drizzle over the top of the cake. Bake cake in 13x9 pan according to package instructions. Allow to cool. Using the end of a wooden spoon, poke holes in the top of the cake. Pour caramel syrup over the cake, making sure to pour over the holes. Next, cream together cream cheese and powdered sugar. Mix in the caramel creamer. Pour and spread evenly over the cake. Top with whipped topping and toffee bits. Drizzle additional caramel over the top of the cake if desired. Chill for 4 hours before serving.